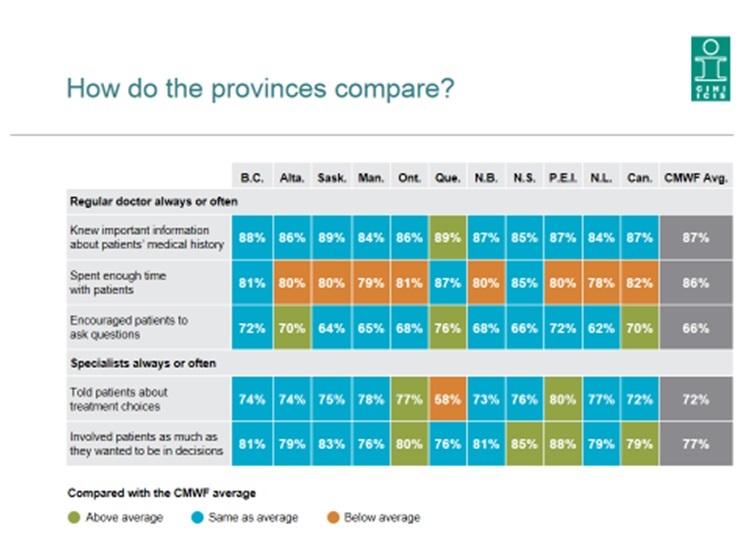 What is the Ideal Health Care System for Nova Scotia? 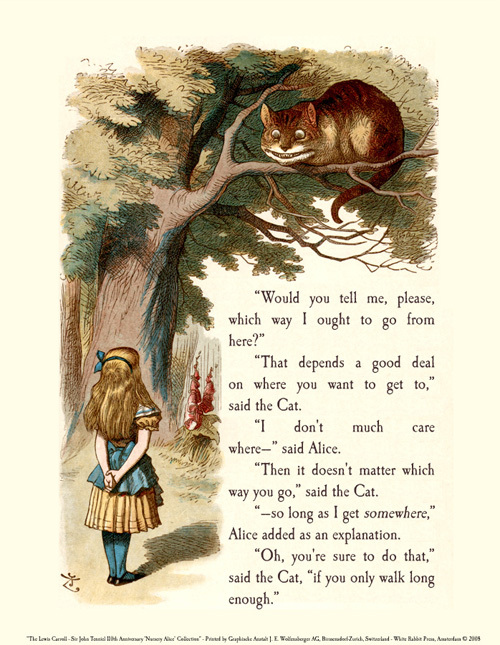 I am also reminded of the conversation that Alice in Wonderland had with the Cheshire Cat. “I don’t much care where—” said Alice. “—so long as I get SOMEWHERE,” Alice added as an explanation. A lot of the time, it appears we don’t know where we are going in health care. We need guidelines. Fortunately, there have been models developed about health care. Most people who are not intimately involved in health care planning (and that includes most health care professionals) don’t know about them but I believe they can actually provide us a helpful road map. Let me tell you about 3 models that I think make a lot of sense. The Triple Aim Framework was developed by the Institute for Healthcare Improvement which for a long time was headed by Don Berwick. Berwick is a guru of healthcare improvement. 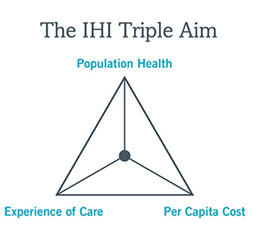 The Framework asserts that any healthcare initiative should have 3 simultaneous aims. The first of the three aims is improving the experience of care which begins with a focus on patients and families and includes high satisfaction, excellent outcomes, especially patient reported outcomes and functioning. For example, patients and families should be and should feel that their needs are at the centre of the healthcare system and that patients’ quality of life is the best it can be. 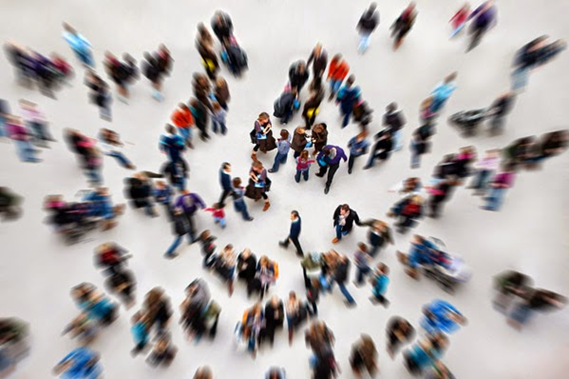 The framework’s second aim focuses on population health. For example, focusing on children with mental health problems who end up in clinics without considering the children who are poor or marginalized and don’t make it to the clinic isn’t good enough. The third aim is to improve cost effectiveness of interventions. A less expensive way of delivering service means more people can be served. Delivering services that don’t work is a waste and wasting money is unethical. 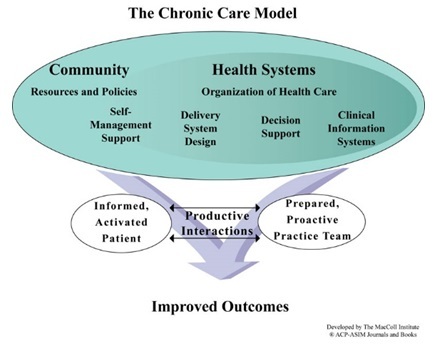 The second model that I want to tell you about is the Chronic Care Model. It has been developed by Ed Wagner of the McColl Centre for Healthcare Innovation at Group Health Research Institute in Seattle. There are several things that I like about the Chronic Care Model. First of all, we do acute care quite well and it is chronic care that we fall down on. Second, the model emphasizes the need for partnership between the health system and the community and between health care providers and patients. Each group has responsibilities to fulfill. The Chronic Care Model is very widely used across Canada and in Nova Scotia. Although it was originally designed for chronic care in adults, it is just as applicable for kids. If you look at the figure, you see that the Health system needs a good clinical information system. The Nova Scotia One Person, One Record promises to be this system. It could move us very far forward in designing a system that works. But we need it sooner not later. 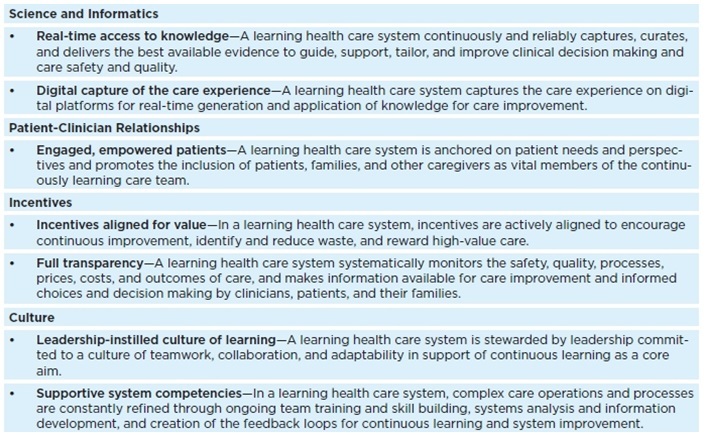 The last model I want to tell you about is the Learning Healthcare model. The Learning Healthcare model has been developed by the Institute of Medicine of the National Academies of the United States. It has a very simple criterion. Every patient should get the best care and we should learn from each patient experience to improve the system. The table outlines some key elements. As you can see, the three models are complementary. They overlap. But each is a bit different in its emphasis. From my perspective, a couple of things are important. The health system should adopt specific models and guidelines and make them public. The public (and the government) should hold the system accountable. Complain when the patient/family experience is not optimum. Lobby government to ensure the system can be more responsive. Do we need more money to do this? Many have pointed out that about a third of what we do in healthcare has no evidence that it works or even may do harm. If we stopped these things we would have the money. Can Nova Scotia health research help Vietnam’s children? The last two weeks, my wife and I escaped the ice, snow and cold of Nova Scotia and went to Vietnam for a holiday and for research (we did manage to still get back in time for two storms in one week) . Vietnam is a great place to visit. The people are warm and helpful. It has thousands of years of culture. The food is amazing and there are incredible sights to be seen. I loved the excitement of the cities and the calm of the countryside. We ate in excellent restaurants and squatted on small stools to eat street food. The only meal we were disappointed in was at an upscale restaurant. 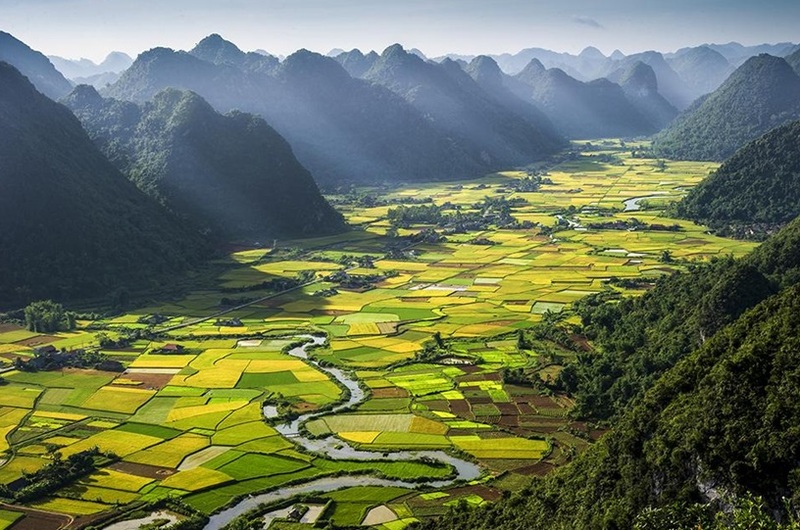 Vietnam has a population of 93 million and is growing at about 1% per year. Hanoi, the capital is a city of 6 million. There are about 26 million children in Vietnam. The first thing I noticed after we left the new international airport at Hanoi was the motor bikes. Thousands flow down each street and crossing the road is an art. One just has to walk out and bikes flow around you like a school of fish. The two most amazing things are that at intersections they weave between each other and that motorbikes carry everything including chickens, entire families and trees. We also noticed that everyone is connected via cell phones. Every street has 2 or 3 phone stores and there are 131 cell phone subscriptions per 100 people in Vietnam compared to 81 per 100 people in Canada. Vietnam is a low income country but is making progress and joining the official ranks of the lower middle income countries of the world. The economy is growing at 5.4%, about two and a half times the rate of Canada’s growth. Poverty, however, is still a huge problem. The Gross National Income per person in Vietnam is about $1740US compared to the $52,200US in Canada. We found the Vietnamese warm, entrepreneurial, energetic and very proud of their country. At the end of the first millennia, they freed themselves from the Chinese and established their independence. From the 1860’s till the mid 1950’s, France was a colonial occupier. The Japanese were in charge during the Second World War. In my youth, I protested the Vietnam war. The American war (as it is called in Vietnam) lasted for a decade before the collapse of Saigon in 1975. After that the Vietnamese fought another war, a limited regional war with the Chinese. Vietnam remains a single party country with the only party being the communist party. I ended up in Vietnam because of a meeting hosted by the Graham Boeckh Foundation in Montreal last year where I gave a talk about Strongest Families. 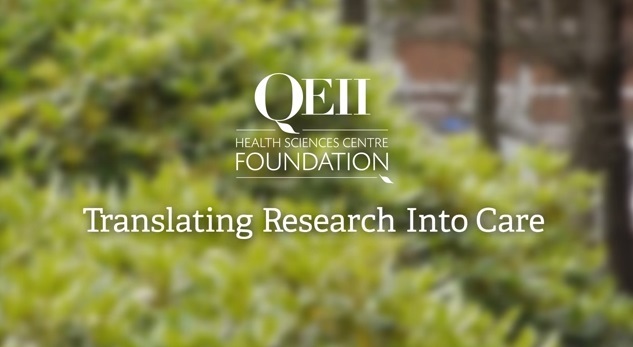 Strongest Families is the distance child mental health program that was begun at the IWK with funding from the Canadian Institutes of Health Research. Eliot Goldner from Simon Fraser University suggested I join the Grand Challenges project he was doing with Dr. Vu Cong Nguyen from the Institute of Population, Health and Development in Hanoi and add a child mental health component. So, I was in Vietnam to discuss starting a Strongest Families Vietnam program. There are very few child psychiatrists or child psychologists in Vietnam. The culture has, until now, had a difficult time dealing with child discipline and a recent UNICEF report found that over 90% of children experienced psychological aggression and 65% experienced physical punishment in the previous month. The group of scientists, NGO and governmental officials that I met were among the most thoughtful and innovative individuals I have ever encountered. Their focus was on improving child behavior problems using the best science, adapted to the Vietnamese culture. Beginning with a small feasibility study, we hope to have funding from Grand Challenges Canada and the Vietnamese government to do a larger study. Perhaps we will have a nation wide Strongest Families Vietnam program. It is a bit ironic that it may be easier to scale up an innovative program in a low income country with few resources than in a developed country such as Canada. Categories: Health Care, IWK Health Centre, psychology, research | Tags: Vietnam | Permalink. Shouldn’t we want to know early if we have a disease? It just seems obvious that we would want to screen for everything and treat it before it got bad. You have probably heard about big companies that each year give all of their executives an amazingly thorough checkup including lots of ultrasounds and even whole body MRI and extensive blood and urine analysis. The latest idea is to get your whole genome analysed. You can do it for $795 to $3000. Many more population screening tests are being promoted. The test does not trigger harm. There is a treatment that works. So let’s look at these issues. It is surprising to many that lots of population screening tests are not really that accurate. Of course it depends on what you mean by accurate. The traditional way of defining accurate is sensitivity and specificity. 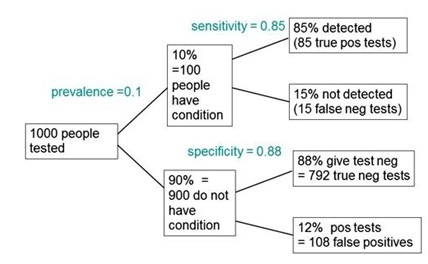 Sensitivity is the proportion of true positives and specificity is the proportion of true negatives that the test correctly identifies. You might have seen a screening blood test for Alzheimer’s Disease mentioned on the news as a breakthrough discovery from an international group led out of Kings College in London England. They correctly identified 85% of people with dementia (sensitivity) and 88% of people who did not have dementia (specificity). Not only the newspaper but also reputable associations touted this test as a promising way to screen for Alzheimer’s. That is all pretty impressive for a blood test. But is it true? Look at this tree plot diagram from a blog by Professor David Colquhoun. He showed that given that about 10% of us will develop Alzheimer’s, out of 1000 people tested, there would be 193 with a positive test result but 108 would be false positives. That means the 56% of people would be told in error they were developing Alzheimer’s. This is called the False Discovery Rate. They would be told they had a disease that they did not have. They would likely worry about normal lapses in memory. They might make life decisions such as taking early retirement because of the false information. They might get depressed because they thought they were going to get Alzheimer’s. So thank goodness, the government is not going to fund this test. With Alzheimer’s, there is no test to confirm if you have the early stages of the disease. So more than half the people who tested positive using that test would be stuck with a wrong test with no way of finding out if it were wrong. But what about the true positives? Might they not benefit from screening? Some would say, that is not so bad if there were a good treatment for Alzheimer’s. Everyone could take it. But there is no good treatment for Alzheimer’s disease. The treatments for Alzheimer’s are expensive and convey very little benefit. On average they may slow symptoms by a few weeks or months. As well, there is no evidence that these drugs are more effective if taken early. So there is no way of benefiting from a true positive result. I read a very interesting article that summarized studies of attempts to add years to life by screening in diseases in adults that cause death. This systematic review found scant evidence that any screening program in adults delays death at all. Moreover, there have been recent challenges to screening for breast cancer and for prostate cancer. Needless to say, these ideas are controversial. That is not to say that all screening programs are bad. Many of the screening programs that we do in babies where we detect serious illnesses that can be treated have value. For example, screening for PKU. Without screening there is almost certain very serious results and early death. With screening and early intervention there is a good quality of life. As well, these arguments do not apply to diagnostic tests. Diagnostic tests are given to people when there is suspicion of disease. They can be helpful and form the basis of much of our medical care. However, a recent systematic review of 140 studies of new diagnostic tests showed only minimal effects on patient outcomes even if they changed treatment. So we are not getting that much better with new diagnostic tests. There are two other uses of screening tests that can be valid. First, to screen high risk people for a specific disease when there is a good treatment that can be usefully given earlier. Second, to screen for inclusions into randomized trials. A major problem in research occurs when people with different diseases are included in a trial. The results may be a mess. So refining who goes into a trial can help immensely in figuring out if a treatment works. This use of screening will eventually help patients if a better treatment is found. It is very different from population screening of people who have no symptoms. So, as you can see, I am skeptical about population screening. It may do more harm than good. We should look carefully at all population screening programs. Sustainability of the Canadian health care system: In “evidence” we trust! Last year when I was at a local Cancer Research Conference, I struck up a conversation with a very sweet, older lady about the status of cancer treatment options in Canada. She told me that she was a breast cancer survivor and felt very lucky to be living in a country that has a publically funded healthcare system. But then, she also expressed that she was not happy about the fact that our hospitals did not have the very latest machine, the one she had heard about in the news that diagnoses breast cancer at early stages. She insisted that we are not spending enough money to get these new technologies. That conversation really got me thinking about how we perceive our healthcare. Is it really true that Canada does not spend enough on healthcare? Well, according to the Canadian Institute for Health Information (CIHI), we spent an estimated $211,000,000,000 (yes, that is 211 billion dollars!) 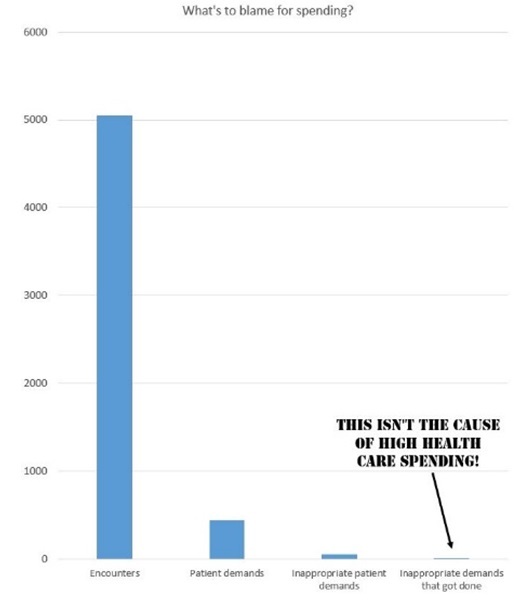 on healthcare in 2013. 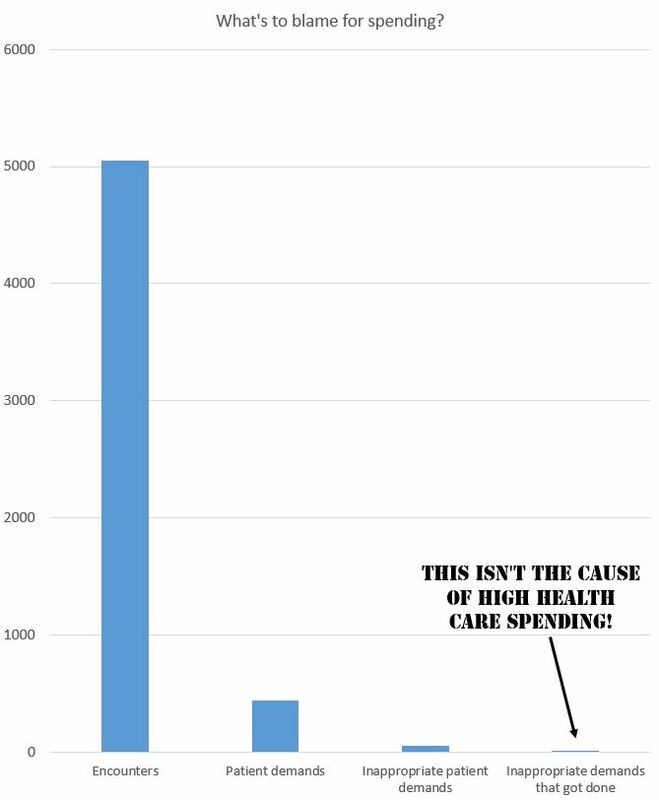 If we spent such an immense amount of money on healthcare, why are only certain things funded? Why can’t we afford everything that is on everyone’s medical wish list? Or why can’t we just spend more (we are spending $211 billion right now anyways so what’s another few million dollars)? In reality, we are already spending too much. Most policy makers now agree that at the current rate of expenditure, the Canadian healthcare system will soon become unsustainable. This realization has forced us to make some tough decisions regarding funding. But who gets to say what to fund and what not to? How do we go about making these decisions in a fair, ethical, and economically sound way without affecting the quality of healthcare? There is no magical formula to answer these questions. But, one of the most appropriate solutions to achieve sustainable healthcare would be to make our decisions based on the evidence. So what is evidence? In general terms, evidence is a body of facts that is collected through scientifically valid means of research. Thus, it is explicit that the generation of evidence requires research activities. However, who performs such research and how it gets decided what needs to be researched? Traditionally, such evidence was derived by researchers doing their research in academic settings. In this model, researchers do research and policy makers do policies in their respective “silos”. What we have lacked, in most part thus far, is the collaboration between researchers and policy makers. The biggest criticism for this traditional system is that the knowledge synthesized by “researchers” is very academic and lacks the context of the feasibility in the real world which is sought by “policy makers”. Such disconnect between researchers and policy makers restricts the evidence-informed policy making practices. Not surprisingly, in recent times many research agencies have explicitly advocated for the active collaboration between researchers and policy makers. This new trend is exemplified by two examples: one at the national level and the other at the local level. The Canadian Institutes of Health Research (CIHR), the Government of Canada’s health research investment agency, launched a new program called the Evidence-Informed Healthcare Renewal (EIHR) to “support researchers and decision makers to work together to advance the current state of knowledge, generate novel and creative solutions, and translate evidence for uptake into policy and practice to strengthen Canada’s healthcare systems.” Similar collaboration between researchers and policy makers is also promoted through the Translating Research Into Care (TRIC) Grants of QEII and IWK Foundations. It is now clear that the solutions for sustainable healthcare will come through the collaborative efforts between the various components of the system. In this multi-disciplinary model, researchers will work alongside with policy makers and draw upon each other’s expertise to develop academically sound and practically feasible solutions. Only through such an integrated approach, we will be able to produce the evidence that will aid our mission to develop the policies to sustain our healthcare system. 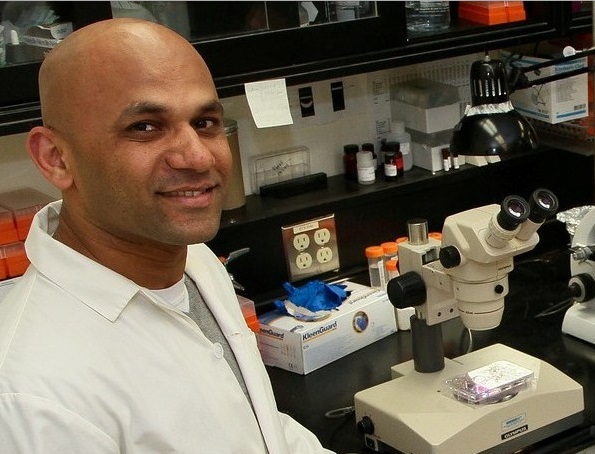 ~ Dr. Shashi Gujar, is a scientist with Strategy and Organizational Performance, at the IWK Health Centre, and also works with Faculty of Medicine, at Dalhousie University as a researcher. Categories: Uncategorized | Tags: Canadian healthcare system, healthcare system, policy makers | Permalink. Whenever something is wrong in health care, we tend to blame the patient or if the patient is a child, we blame the parents (especially the mother). Patient blaming takes lots of different forms. One is what I call the psychogenic bogeyman. If we cannot find the cause of a problem, we say it is psychological or “all in your head”. Now I am not against recognizing the incredible value of psychology. After all I am a clinical psychologist and founded and led for a decade the PhD program in Clinical Psychology at Dalhousie University. One of my first research studies published in 1983 was on recurrent abdominal pain. Recurrent abdominal pain was described as pain in children that kept coming back and no known organic cause could be found. It was quite common, especially in girls around 12 years of age. At the time, it was assumed that the problem was a difficult personality and a difficult family. I was just starting out in my career and this was a great problem to tackle because it was common and assumed to be psychological in nature. I was very disappointed because in this study of 30 children with recurrent pain and 30 children without pain, I failed to find any differences between children with recurrent abdominal pain and children without pain. I had to conclude that we should not diagnose pain as psychogenic unless we had positive evidence. Unfortunately, people still make what Patrick Wall, a distinguished physiologist in pain, called “a leap to the head,” the tendency to say a disease is psychological in origin just because we can not understand it. Although we now know that autism is not in any way caused by parents’ behavior, the myth that cold rejecting or “refrigerator mothers” cause autism persists. How else do we blame patients? We blame patients for overuse of medical tests and treatments. Even the Choosing Wisely campaign which I have endorsed several times in this blog implies that patients are responsible along with their doctors for unneeded tests and treatments. I think patients can provide a very helpful boost to getting the best care but patients are not the problem. I recently saw a post in an excellent blog, the Incidental Economist, on a study published in JAMA Oncology about patient requests. They studied 5050 patient cancer visits by interviewing the doctors right after the visit. There were 3624 patients and 60 clinicians involved. Four hundred and forty or about 9% involved a patient request for a test or treatment. Doctors granted 83% of the appropriate requests. There were 50 requests that the doctors felt were not appropriate and they granted only 7 of these. That is, inappropriate requests were granted in only 0.14% (7 of 5050) of visits. Here is a graph from the blog. An editorial in JAMA Oncology “The myth of the demanding patient” argued it is about time we stopped blaming patients for inappropriate tests or treatments. Another way we blame patients is by calling them derogatory names. Dr. Brian Goldman the host of White Coat, Black Art on CBC radio published The Secret Language of Doctors in which he tells about different terms that have been used for patients. This hostile approach to patients has, in my opinion, declined in recent years but it has been replaced by the “lifestyle blame.” In the lifestyle blame, patients are blamed for their bad choices in not being active or in being overweight. Adults and children who are overweight may be able to make better choices in their food. Fresh fruit and vegetables in the poor areas of town or in rural areas where many poor people live (there often are not even supermarkets). Places that are safe to walk in poor or rural areas. Cooking classes emphasizing nutritious inexpensive foods for kids and parents. Physical education time in school that is appealing to kids, especially overweight kids. Time for physical activity if you hold down two jobs to make ends meet. I don’t mean to absolve each of us for our health choices but let’s be realistic. Eating well is a lot easier if your income is not below the poverty line. In Nova Scotia child poverty is a huge problem with 22% of children living in poor families. It is a staggering 33% in Cape Breton! 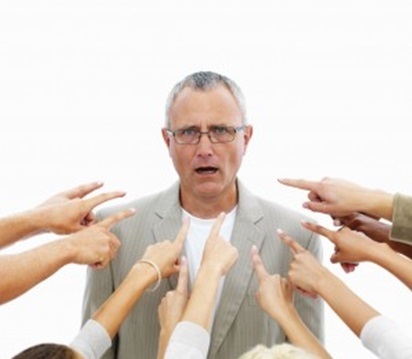 Why do we blame patients? I don’t think it is because we are bad people. Doctors and other health professionals are no better or no worse as human beings than anyone else. We blame patients because we don’t like to admit when we don’t know what to do or we are frustrated or feel powerless. We are better off admitting to the limitations of our knowledge and our own feelings of inadequacy than to blame our patients. We, the health professionals and the health bureaucrats, need to realize that in everything we do patients are the reason for the health system; our job is to serve patients. Let’s put an end to patient blaming. Categories: Uncategorized | Tags: abdominal pain, children, health care, JAMA Oncology, recurrent abdominal pain | Permalink. I failed my first statistics course. I am reasonably bright but had a phobia of numbers and formulae. More importantly, I was not motivated to learn all of those strange concepts. After all, I was studying to be a clinical psychologist and help people. I didn’t want to become a statistician or an accountant. It also didn’t help that the statistics professor felt it was his job to intimidate students and make them feel stupid. From his point of view this helped students study hard and learn. Thank goodness when I took my first statistics course in my PhD program, I totally lucked out and had a brilliant teacher in Dr. Alastair MacLean. His goal was to help his students understand numbers and statistics so that they could accomplish what they wanted. Since that time, I have learned much more about statistics and numbers. Let me tell you why I am glad I overcame my fear of numbers. Whenever, I go to the doctor, I ask “How likely is it this treatment will help me?” I usually get something like “It is pretty good’” or “There are randomized trials showing it works.” Nothing too precise. There is, however, a great statistic to answer that question with. It is called Number Needed to Treat or NNT. NNT refers to the number of patients that are needed to have one person benefit above what would happen naturally. Of course NNTs have to be used in the context of the patients’ values. So if a disease or disorder is inevitably going to kill me in a year and 1 in 5 patients survive with the treatment, the NNT would be 5 and I would certainly try it unless the side effects were so horrendous that I would rather die. But if the NNT were 100 and it would make my remaining time uncomfortable or if it would cost so much as to make my wife penniless if I did die, I probably would not take it. Number Needed to Harm or NNH is very similar but the number refers to a specific side effect. Most diseases have some natural remission and so NNT is a bit more complicated to figure out. Technically, NNT is the inverse of the absolute risk reduction or 1/absolute risk reduction. It is calculated for two treatments, usually an intervention and a placebo intervention for a defined endpoint. So if a drug for face rash eliminates 80% of the rash within 1 month in 70% of patients and 50% get 80% better on a placebo drug, the NNT would be 1/(0.7-0.5)=5. An NNT of 5 is very good and if the treatment was of modest cost, I would probably do it. There is a great web site that has carefully collated data and calculated NNTs. It is called The NNT. Here are a few examples from that site. -Mediterranean diet for those with a previous heart attack, to prevent a second heart attack NNT=18; to prevent death NNT=30; to prevent cancer NNT=30. There were no harms seen. -Training for falls prevention in the elderly NNT=11 with no harm seen. -Low dose aspirin each day for a year to prevent a heart attack NNT=2,000 or to prevent stroke NNT=3,000 NNH for a major bleeding event was 3333. Many treatments do not have NNTs worked out but we will see this statistic increasingly being made available. There are not many NNTs worked out for children’s illnesses because very often drugs are not tested on children. Another source of information about whether a treatment or a test is likely to do harm or good is Choosing Wisely which I mentioned in my June 12, 2014 blog. Choosing Wisely has developed lists of tests and treatments that you should be talking to your doctor about. But they may do more harm than good. For example bone density tests are often used to see if older people (like me) have weak bones. The problem is that for most the test is not needed and the finding of weak bones often leads to being put on drugs that not only don’t do much good for most people but also have significant risks. There are other things we can all do to keep our bones strong such as stopping smoking, limiting alcohol, exercising and eating well. Categories: Uncategorized | Tags: NNT, statistics course | Permalink. The Canadian Institute of Health Information, a federal agency that focuses on health statistics just released a survey on healthcare in older Canadians. The report was in conjunction with the Commonwealth Fund, a not for profit think tank based in the USA. The first thing I have to object to is that anyone who is over 55 was classified as older. None of us thinks we are as old as we are. In fact most people over 25 think they are really about 20% younger than they are. But on the cusp of my 68th birthday, I don’t feel a day over 45. However, I do relish the senior rate on the bus and at the movies. 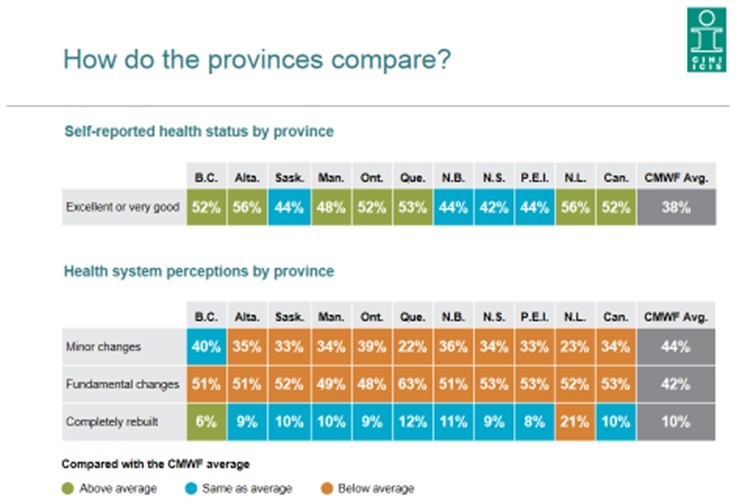 The nice thing about the CIHI survey was that it compared each province with the average of other developed countries. One of the problems is that the sample size for each province was quite small, Nova Scotia only had 258 responses. The response rate was only 28%. So how did we do? Most older Canadians (96%) had a regular doctor they went to for healthcare. 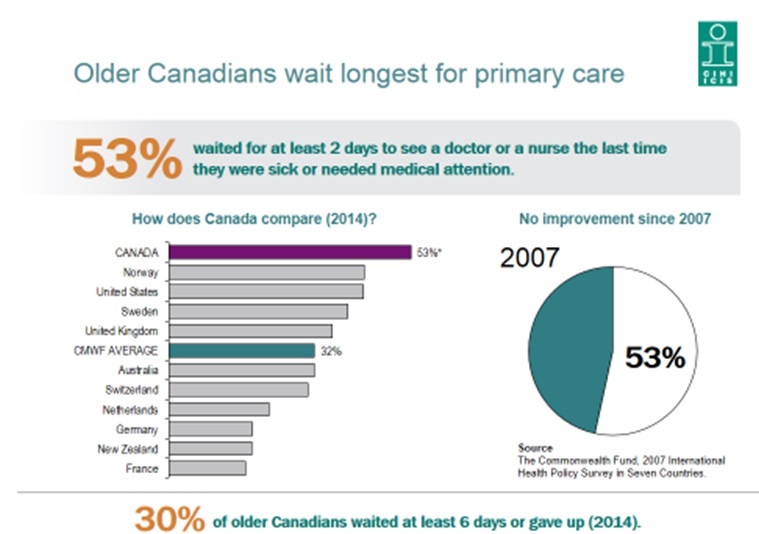 But Canadians in every province had a longer wait time for primary and specialist care than other developed countries . 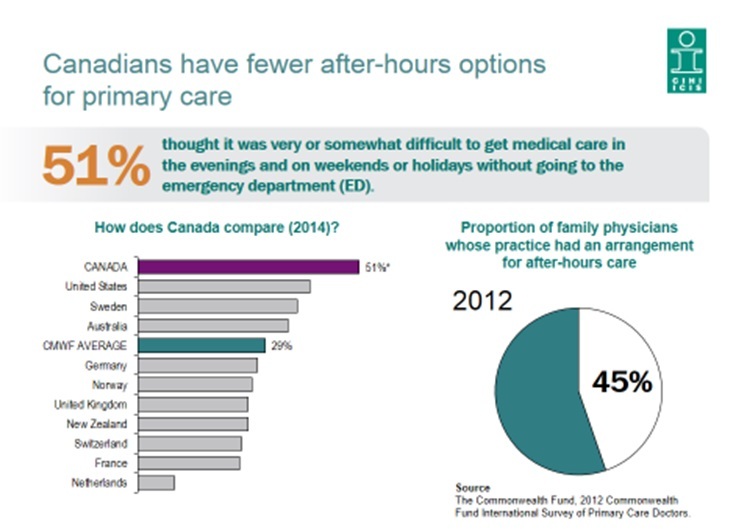 Canadians also have a hard time getting after hours care without going to the Emergency Department. As a result, almost 40% of Canadians went to an Emergency Department for something that could be treated at a family doctor. As well, Canadians wait more than any other country for specialists. 25% of older Canadians waited more than 2 months for a specialist. This has not improved over time. But most Canadians report positives about their doctors. 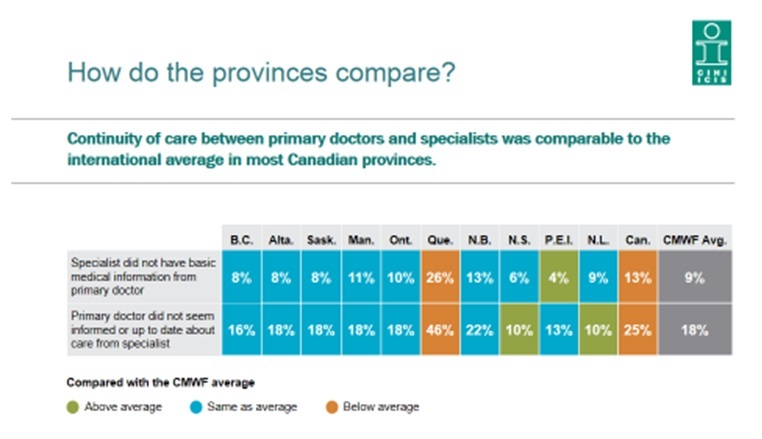 I was pleased to see that the Maritimes did a bit better than most in continuity of care. 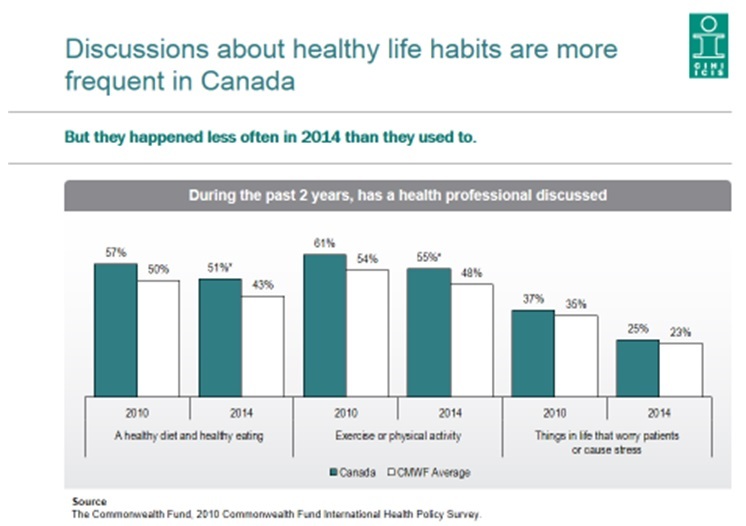 Finally, lets look at what Canadians over 55 think about their health and our health system. Categories: Uncategorized | Tags: Canadians, Commonwealth Fund, health statistics, The Canadian Institute of Health Information | Permalink.